History records a man who lived, a man who 10 generations after a great flood used celestial science to prove the existence of God. He was a skilled scientist, astronomer and mathematician. His astronomical discoveries shook the very foundation of Babylonian religion and heavily influenced not only Austrian culture, but Egyptian scientific thought as well. He led armies that altered the course of Assyrian history. We know this man as Abraham, the father of Isaac, the son of Tehrah, a descendent of Shem. There is astounding evidence of both Biblical and secular history to prove that the patriarch Abraham was not only real; he exerted a tremendous effect on the entire ancient world. This influence is recounted in the writings of the Jewish historian Josephus, the Bablyonian historian Berossus, the Roman historian Euseblus and in the medieval Austrian Chronicle. Abram born circa 1996 BC was born in the city of Ur in the land of the Chaldees, part of the Assyrio-Babylonian Empire, listed by Roman historian Velleilus Paterculus as the first world empire. Quoting an earlier source in his book Roman History, it is apparent that King Ninus began his rule sometime during the 22nd century BC, less than 200 years before Abraham’s birth. King Ninus, who is identified in the Recognitions of Clement as the biblical Nimrod, became the post-flood world’s first emperor (Gen 10:8-12), gathering his followers into cities such as Babel, Erech and Accad. Nimrod led Asshur, the father of the Assyrians, out of Babel and supervised the construction of Nineveh, the City of Ninus, which he would rule with his father Cush. According to a list of Assyrian Kings recorded by Sextus Julius Africanus, Cush ruled for 55 years and after his death Nimrod ruled an additional 52 years. After Nimrod died, his wife Semiramis ruled another 42 years. Greek historian Diodorus of Sicily [60-30 BC] in his Bibliotheca Historica recorded that Ninus [Nimrod] and his wife ruled an empire stretching from Libra to the borders of India. Rebelling against God, they set up a pagan religion based on sun worship, with Nimrod as the Sun god. In the province of Sumeria however, Semiramis was worshipped as the goddess Inanna, the morning and evening Star and Nimrod as Dumuzid, a god who was a precursor of the Babylonian Tammuz. The ancient Babylonian historian Berossus wrote that “In the tenth generation after the flood, there was among the Chaldeans a man righteous and great, and skillful in the celestial science.” While he did not specifically name this man, the first century Jewish historian tells us that he was writing about Abraham. Josephus also mentioned that the Greek historian Hecataeus of Abdera wrote an entire book of Abraham’s accomplishments which was lost when the royal library of Alexandria was burned. The Babylonia priesthood established by Nimrod was teaching the masses to believe that the sun, moon, stars and planets were manifestations of the god. Abraham taught the people physics and mathematics, that the planets celestial bodies moved according to preordained laws. He taught that there was only one true God, the creator of the universe. 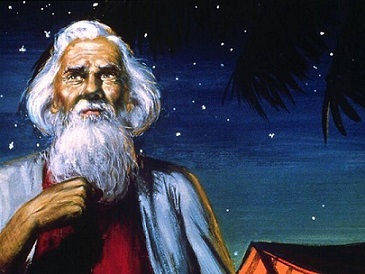 Other ancient records indicate that Noah had knowledge of maritime astronomy involving navigating by the stars, bringing the knowledge of math, astronomy and other sciences from one side of the flood to the other, passing it down from generation to generation. As the pagan priests of the Assyrio-Babylonia Empire gained power and influence, they forced Abraham to flee Ur. Josephus recorded that the Chaldeans “raised a tumult” against Abraham and would have killed, and likely did kill his brother Haran. The Bible only records that Haran “died before his father Terah in the land of his nativity, in Ur of the Chaldees [Gen 11:28] Josephus adds that a monument was erected in Haran’s honor. In a fascinating old World record, the Austrian Chronicle, a monumental German work of over 100 volumes preserves the history of the Danubian Valley, the area of Austria, Hungary, Bohemia, Bavaria, and neighboring regions. Written in German, it has never been translated into English. The Chronicle begins its consecutive history with a man of princely birth – none other than the patriarch Abraham. It is most unique that an ancient Austrian historical record should begin its list of rulers with a Hebrew name!. Yet, apparently, the compilers of this record, who did their work in the 15th century, did not even realize this was the great Biblical patriarch. At least this record nowhere states that this was the Abraham of the Bible. And yet this could be no one else because, when the chronology of the Chronicle is matched with the story of Abraham in the Bible, all the dates fit exactly. There are no conflicts; the story is harmonious in every detail. To recount all the various histories of the things Abraham suffered during this period would fill many pages. He fought in battle against the feudal lord of the land of Aligemorum and lost. He was driven from his country and for a time fell into poverty. He wandered along the banks of the Danube River until he came to the edge of the known world. There, in the Alpine valleys of Europe, he helped found one of the most sophisticated cultures of the ancient world. Then, in the course of time, he returned to Chaldea to connect with his family. While most of this history is corroborated in secular sources, God summarized what is most vital for us to know about Abraham in James 2:23. “And the Scripture was fulfilled which said, Abraham believed God, and it was imputed unto him for righteousness: and he was called the Friend of God”.